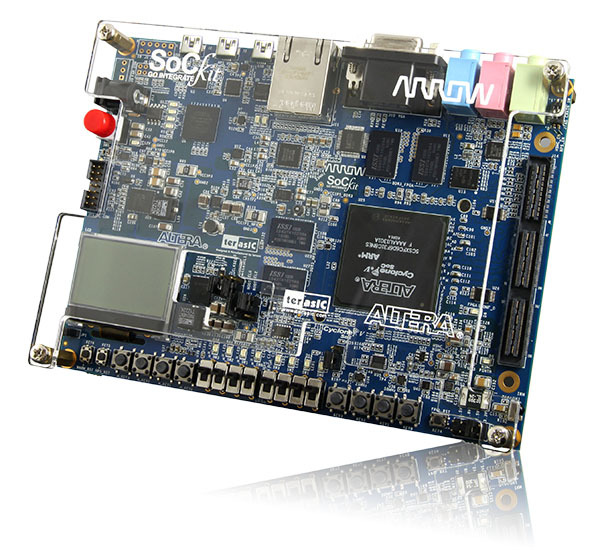 The SoCKit Development Kit presents a robust hardware design platform built around the Altera Cyclone V System-on-Chip (SoC) FPGA, which combines the latest Cortex-A9 embedded cores with industry-leading programmable logic for ultimate design flexibility. Users can now leverage the power of tremendous re-configurability paired with a high-performance, low-power processor system. Altera’s SoC integrates an ARM-based hard processor system (HPS) consisting of processor, peripherals and memory interfaces tied seamlessly with the FPGA fabric using a high-bandwidth interconnect backbone. The SoCKit development board includes hardware such as high-speed DDR3 memory, video and audio capabilities, Ethernet networking, and much more. In addition, an on-board HSMC connector with high-speed transceivers allows for an even greater array of hardware setups. By leveraging all of these capabilities, the SoCKit is the perfect solution for showcasing, evaluating, and prototyping the true potential of the Altera SoC.